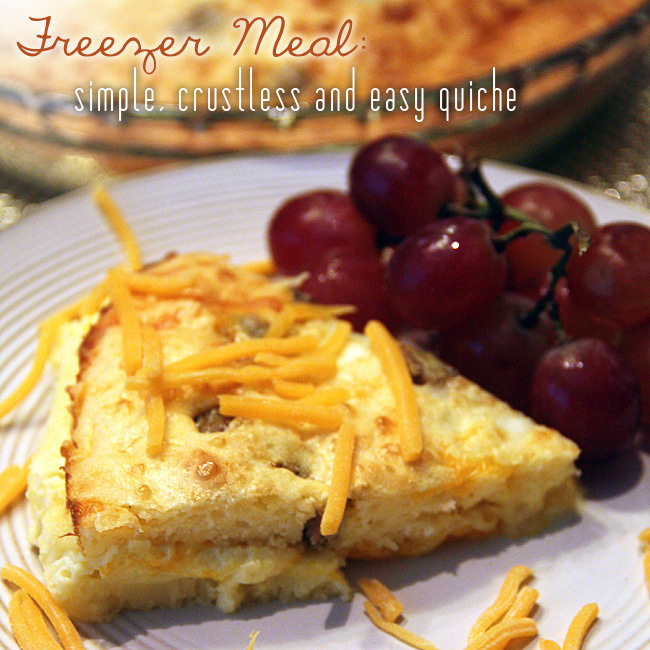 Are you ready for This Month’s Freezer Meal??? I know I did breakfast meals in November and December, so I thought a nice WARM dessert would be perfect for this month. A nice peach crisp! 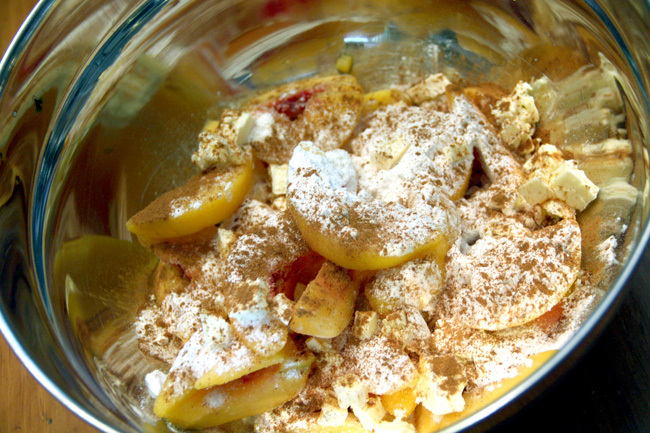 And, ohhh, I can’t wait to try this again in the Summer with peaches fresh off the peach tree! 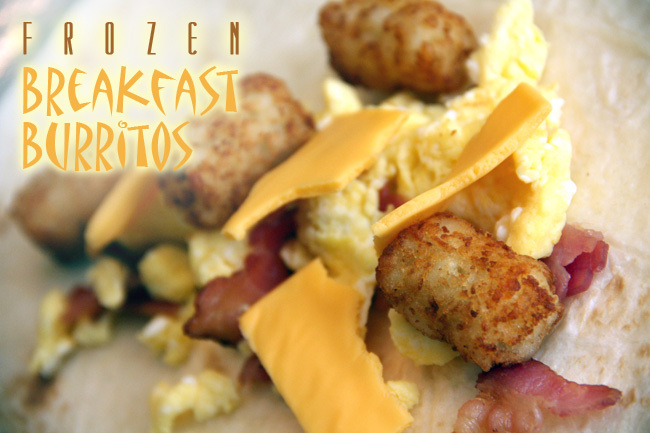 Now my mouth is watering… I also want to try this recipe with APPLES! 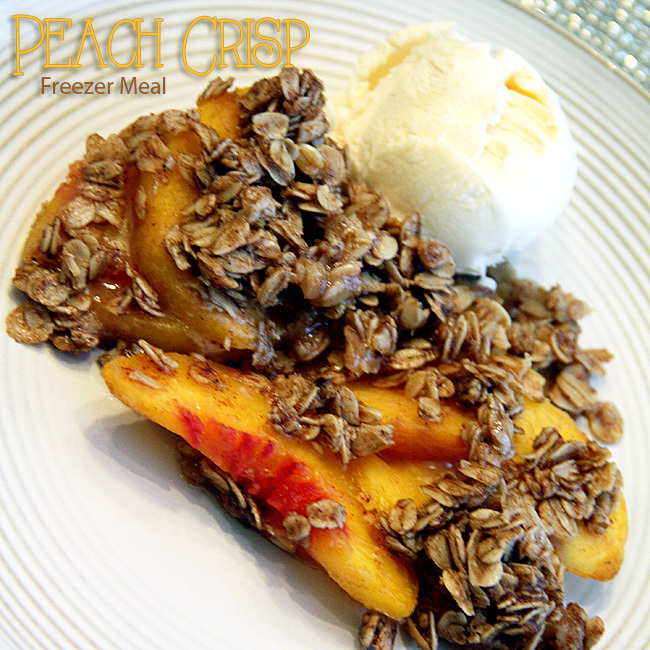 You can whip up TWO peach crisp meals in 10 minutes if you are using frozen peaches… Not bad. I put one directly in the oven and froze the other. I had all of the ingredients at home except for the frozen bags of peaches. 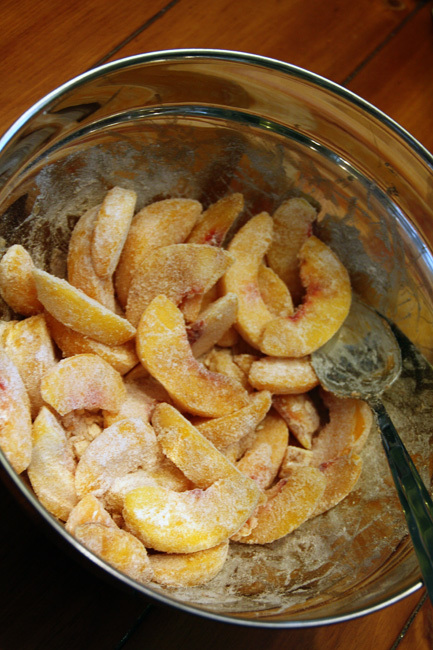 Slice peaches (if they are fresh) and mix together all the ingredients for the peach filling together in a large bowl. 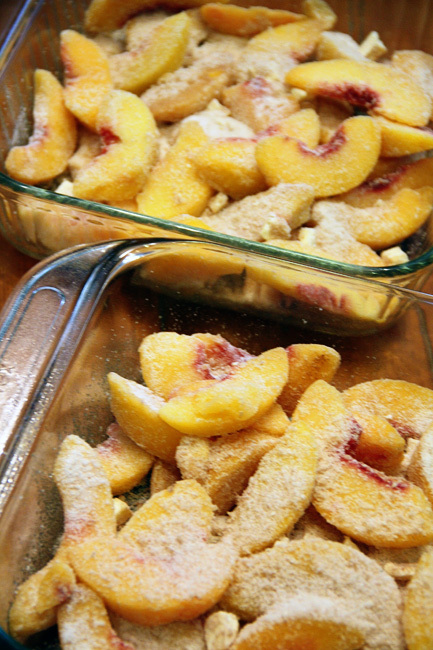 Divide peach mixture into 2 8×8 buttered baking dishes and set aside. 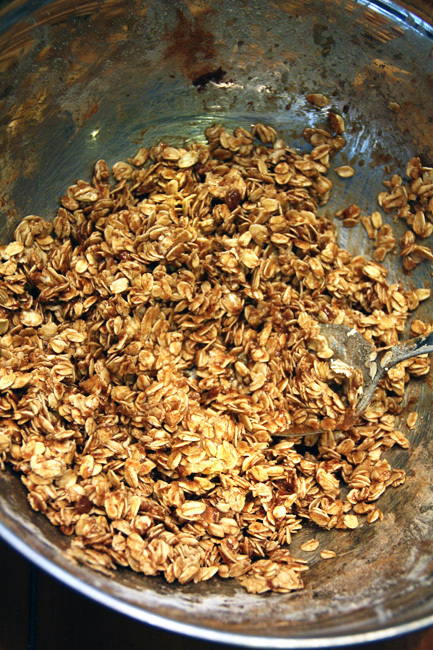 Place the ingredients for the oatmeal topping in bowl and using a fork, work the ingredients together for a minute or two until they are nice and crumbly. Sprinkle over peach filling, cover with foil and freeze. When you are ready to use, bake from frozen at 350° F for about 45 minutes, remove foil and cook an additional 10 minutes or until the juices are bubbling. Serve warm with ice cream. This recipe is for 2 8×8-inch pans. I always write what the freezer meal is and baking directions on the foil lid before placing in the freezer. FULL recipe at bottom of this post. So, what do you think? 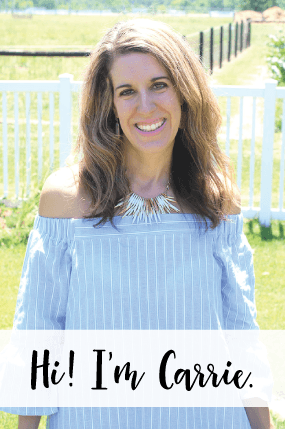 Have you ever thought of freezing a dessert? This would be great for a dessert on a busy dinner night OR if you know you need to bring a dessert for a food day at work, school or church event, when you have house guests, etc. 1. 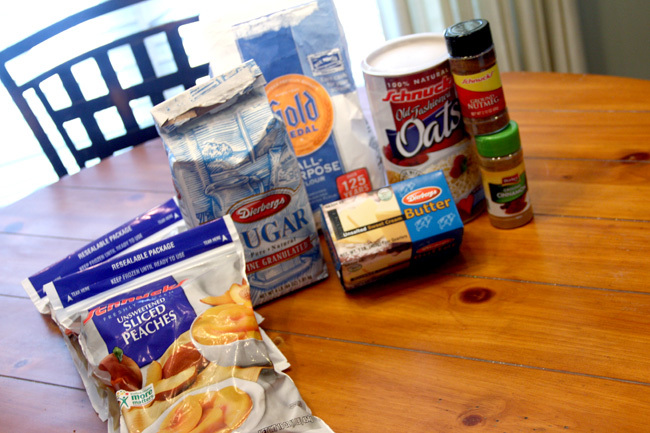 Slice peaches and mix together all the ingredients for the peach filling together in a large bowl. 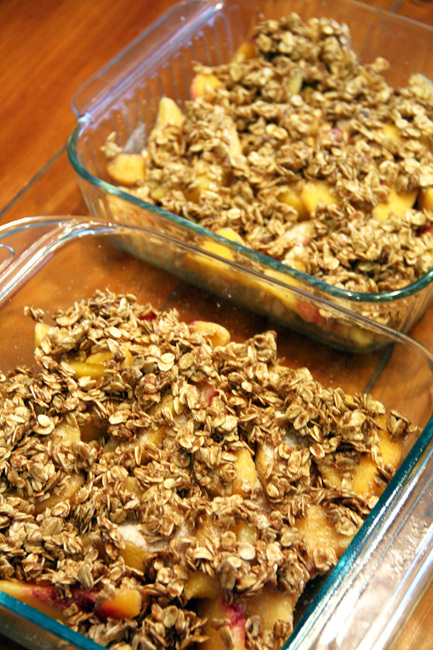 Divide peach mixture into 2 8×8 buttered baking dishes and set aside. 2. Place the ingredients for the oatmeal topping in bowl and using a fork, work the ingredients together for a minute or two until they are nice and crumbly. 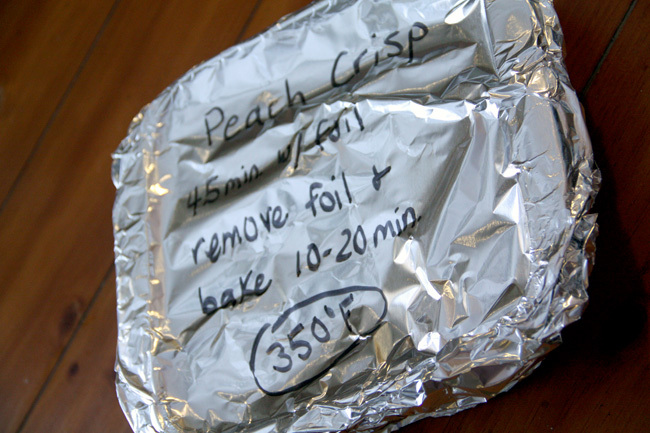 Sprinkle over peach filling, cover with foil and freeze. 3. When you are ready to use, bake from frozen at 350° F for about 45 minutes, remove foil and cook an additional 10 minutes or until the juices are bubbling. 4. Serve warm with ice cream. This recipe is for 2 8×8-inch pans.